If you’re looking for a top notch digital piano or electronic keyboard, the Korg brand is a great place to start. Korg digital pianos are generally slim with sleek, attractive designs. They are simple to use, they’re portable and they produce quality sound with a nice feel. Korg makes some of the most innovative instruments on the market. Founded in Japan in 1963, Korg has always pushed the boundaries of current technology to create instruments that are respected by pros and novices alike. No matter if you are a beginner looking to jumpstart your musical career or an experienced musician, you may find it difficult to choose the best digital piano. There are many options out there, and Korg alone has many great instruments. In this article, we go over the best Korg digital pianos and review our favorites. Hopefully these Korg keyboard reviews will help you wade through the sea of available keyboards and land on the one that’s best for you. The Korg SV-1 88BK is a great-looking and great-sounding digital piano. It has a sleek, curved shape which gives it an elegant, somewhat funky look. The matte black finish looks great, and this piano will certainly turn heads. The SV-1 has a variety of piano sounds that you can choose from. Korg’s RX technology is used to craft the detailed and authentic sounds this keyboard is capable of. When writing this Korg digital piano review, we were continually amazed at the sound this thing is capable of. And, if you’re looking for that real piano feel, the SV188BK has an incredibly responsive key touch with Korg’s RH3 Real Weighted Hammer Action technology. This piano also has a variety of additional features including a variety of outputs for amplifiers and effect pedals, as well as a very clear interface. This keyboard is also uber portable and comes with a soft case and collapsible stand. If you want quality, versatility, and portability, the SV-1 88BK is a winner. If you are looking for a digital piano that will give you that exhilarating feeling of playing in front of a crowded concert hall, then the Korg SP-280 is the perfect match for you. Korg dedicated all of their resources and technology into making the SP-280 sound a feel like a concert grand piano, and after writing this Korg piano review we can tell you that their efforts certainly paid off. The Korg SP-280 gives you 30 varieties of high-quality sounds to choose from. It has clavs, organs, harpsichord, strings, the exceptional grand piano and electric piano suitable for live performers.The piano has outputs for amplifiers and effects for use in live performance. It also looks great with a beautifully sleek design, and comes with a lightweight foldable stand for portability. If you want a piano that’s not only an instrument but a showpiece in your home, the Korg LP-380 should be at the top of your list. 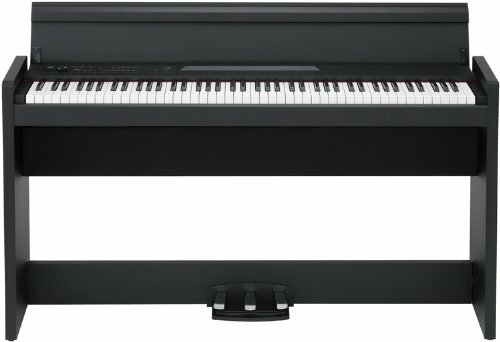 This digital piano is slim and stylish, and when you’re not playing music it transforms into an elegant furniture piece, and many Korg LP-380 reviews rave about its good looks. It also comes with a variety of colors that you can choose from to match up with your home’s interior décor, including rosewood, chic black, vivid red, and pure black or white. Looks aren’t the only thing this piano has going for it. It has Korg’s signature weighted key action and great piano sound, including 30 different high quality samples. 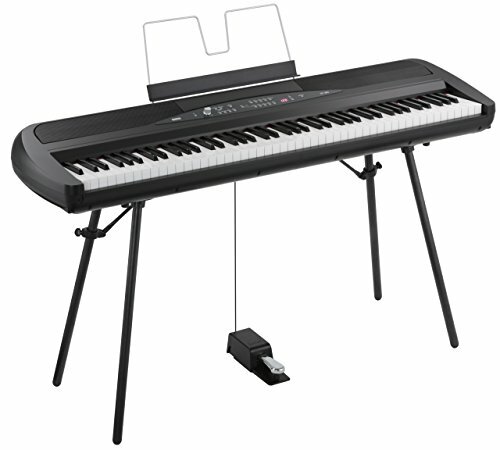 The LP-380 contains a partner mode which separates the keyboard into two sections allowing two people to play a duet. It also has two jacks for digital piano headphones so you can both play silently if needed. If you value music but also want something that looks great and tucks out of the way, the LP-380 is for you. The sleek nicely curved body of the SV-1 73BK 73-key piano is the first thing you will notice when you take a look at this keyboard. Similar to its 88-key cousin the SV-1 88BK 88-key digital piano, the SV-1 73BK features high quality samples of many different piano tones. The SV-1 73-key uses Korg’s RX technology to produce a high-quality and expressive sound. The SV-1 73BK is an excellent performer at home or on stage. The swift, responsive nature of the keys powered by Korg’s Hammer Action technology gives you the confidence you would need when playing for a live audience. This keyboard is also extremely portable, and is packed with your typical Korg features. The little brother of the LP-380, the Korg LP180 offers the same elegant looks and quality piano sound and feel at an affordable price. 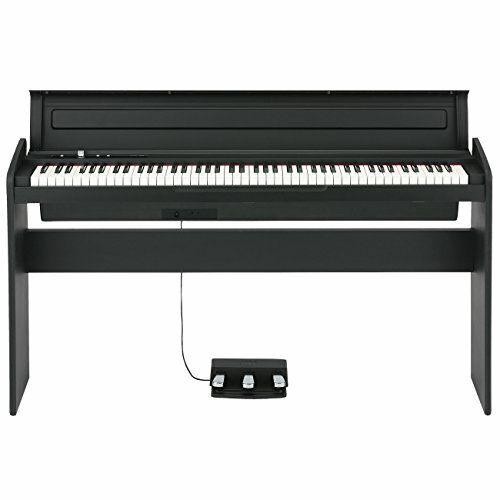 This piano comes in both white and black so you can match it to your home interior décor, and the Natural Weighted Hammer Action keys respond to any style of playing. The LP180 also sounds great, and features ten high quality sounds including vibraphone, electric piano, and strings. It also comes with a reverberation and chorus effect, so you can add some interesting elements to your sound. If you are looking for a compact, stylish, high-performing budget piano for a wallet-friendly price, the LP180 is for you. Korg makes some of the best digital keyboards and music gear on the market, and you generally can’t go wrong with any of the pianos on this list. Like any instrument purchase, your needs and budget will determine which one is the best for you. No matter if you want a top notch stage piano or an elegant showpiece for your home, Korg has something to offer. 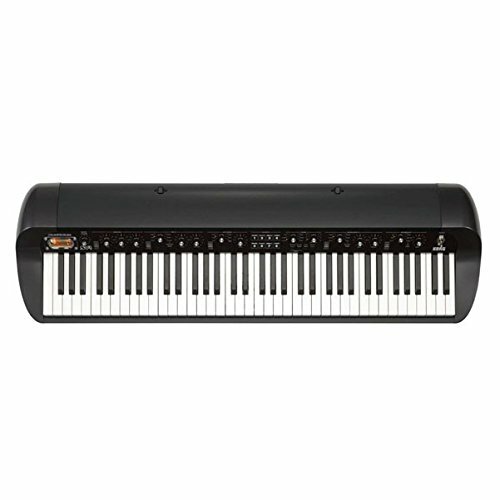 The Korg keyboard reviews in this article should give you a good starting point for determining which Korg digital piano will best suit your needs.